I’m 100 kilometers into The Great New York 100 Mile Running Exposition and in rough shape. Severe blisters have formed under both feet, causing me to wince in pain with each step. I plop into a folding chair at the Forest Park aid station in Queens and take off my shoes to assess the damage. Not good…especially with 38 miles to go. Looking into his convincing eyes, I simply nod, knowing this to be true. I put my shoes back on, grab a slice of pizza for the road and shuffle my way towards Brooklyn and the long night ahead with “no excuses” lingering in my mind. These simple but wise words from Trishul Cherns aren’t taken lightly. At age 60, this distance running veteran and former monk has lived a rare and impressive journey, holding many Canadian national records. In his career he has logged over 42,000 ultramarathon racing miles. I figure I can go another 38. Born in 1957 in Hamilton, Ontario, which sits an hour south of Toronto on Lake Ontario, Cherns was an active kid. In the eleventh grade he began running with his high school’s track team, entering his first race to run the 3000 meters. He finished dead last. His coach approached him and said he should get back on the track for the next event and give the 1500 meters a try. Few could predict the running life that would follow his first failure. Around the same time, Cherns began watching the television series Kung Fu starring David Carradine about a young man known as “Grasshopper” by his master, who joins a monastery to become a Shaolin priest and martial arts expert. And so, right after high school, he discovered the Sri Chinmoy Centre in Toronto and joined to learn the practice and art of meditation. While there, he also reinvented his relationship with running. Where the Shaolin priests used kung-fu as an extension of their spiritual practice, Cherns did so with running. 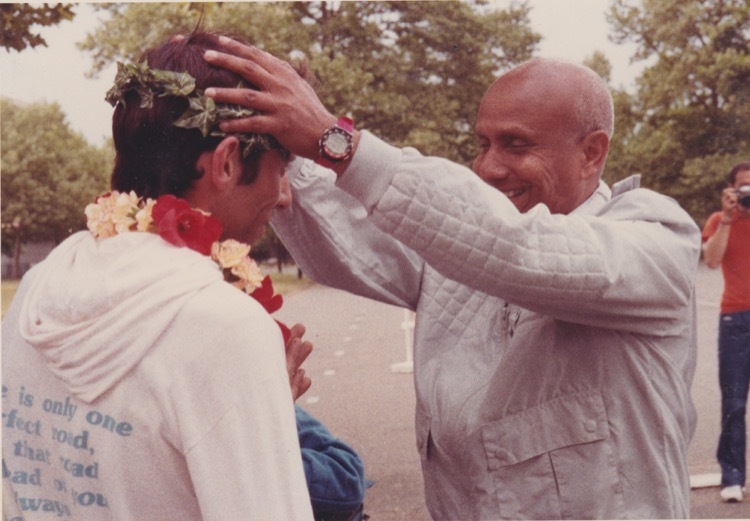 Sri Chinmoy and Trishul. Photo from the collection of Trishul Cherns. He made it part of his routine and eventually found himself joining teams for long distance relays, running five miles at a stretch before passing the torch, completing around 15 miles a day for three to four days. He lived in an ashram without walls in Jamaica, Queens, eating vegetarian, practicing celibacy and learning the ways of self-transcendence. Sri Chinmoy bestowed on him the spiritual name Trishul, meaning trident, the three-pronged mythological spear used to pierce ignorance. He heartily accepted, perceiving it as a powerful name, and has kept it to this day. Lorne Cherns was his birth name. Ted Corbitt and Trishul. Photo from the collection of Trishul Cherns. His goal was to finish, yet he still ran a respectable time of 3:08:49. He could barely hobble down stairs the next day, but was so enamored with the experience that he ran another marathon six weeks later. 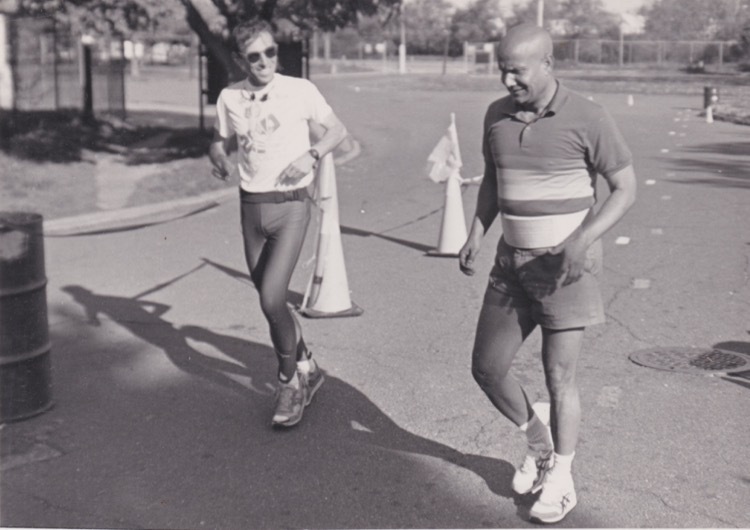 In 1978 he ran his first ultramarathon, completing 47 miles worth of loops around Jamaica High School in Queens to celebrate Sri Chinmoy’s 47th birthday. Two weeks later he wanted to see how far he could run, so he convinced a friend to count laps for him on the Jamaica High School track. He went 90 miles. He began to realize the more he ran, the faster he recovered and started ticking off ultras regularly. In 1981, he ran his first 12-hour track race, followed shortly by his first 24-hour. He mixed in all different race distances and timed events, including a stout 700 mile solo run from Toronto to New York City. 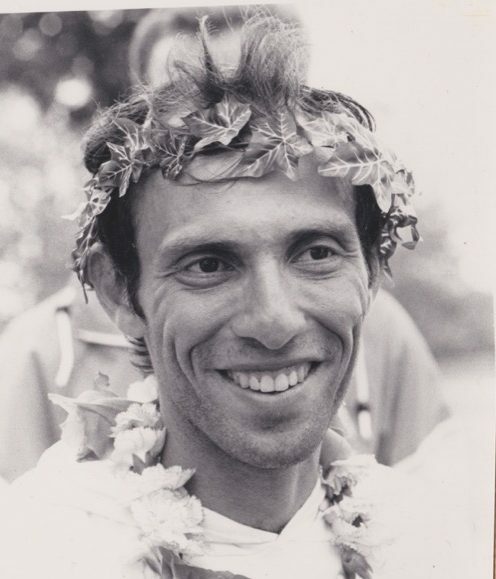 In July of 1983, he entered his first multi-day event, a 6-day run at the track in Downing Stadium on Randalls Island, put on by the New York Road Runners Club and their legendary president, Fred Lebow. He finished 6th with 445 miles. Fred Lebow (left, dark jacket) and Trishul (gray jacket). Photo from the collection of Trishul Cherns. A year later in 1984, he traveled to England and ran 457 miles in six days, then two months later returned to New York and completed another 6-day race with 479 miles, each time bettering his previous mark. 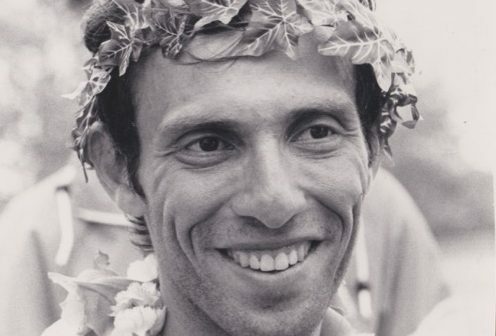 But it was in the fall of 1984 when Cherns crossed a major threshold for himself in La Rochelle, France, running 504 miles in six days. His goal had been to run 500 miles, which was the world class standard then. He gained several sponsorships who would pay his entry fee and travel to both domestic and international races. 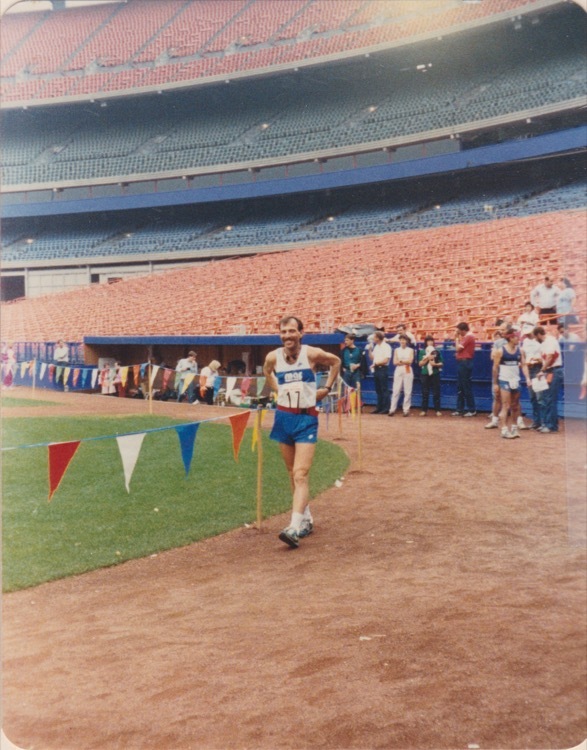 Only a month later, Cherns recovered from the 1,000 miles in time to run the New York Road Runner’s Shea Stadium 100 Mile race. Participants would keep their belongings in the dugout and run one mile loops that went around the baseball field and out into the parking lot. He finished in 18:11:01, sponsored by the MAF team of heart rate training pioneer Dr. Phil Maffetone, who would give him chiropractic adjustments during the race. Trishul at Shea Stadium. Photo from the collection of Trishul Cherns. Phil Maffetone and Trishul in the Shea Stadium dugout. Photo from the collection of Trishul Cherns. Trishul in La Rochelle. Photo from the collection of Trishul Cherns. Trishul and Käären. Photo from the collection of Trishul Cherns. He moved back to New York City with Käären, settling in the Middle Village neighborhood of Queens. While running a 1,300 mile Sri Chinmoy race in Flushing Meadows Park, he had an unusual experience when an affectionate dog began to follow him. Over the next 100 miles the dog ran with him, forming a lasting bond between the two. He adopted him afterwards, naming him Dharma. Cherns frequently ran ultras from 50 km to multi-day events. His training consisted of 125-mile weeks, with half of those miles being speedwork. Three times a week he would go to a track or to hilly Forest Park and run 20×1 mile repeats. 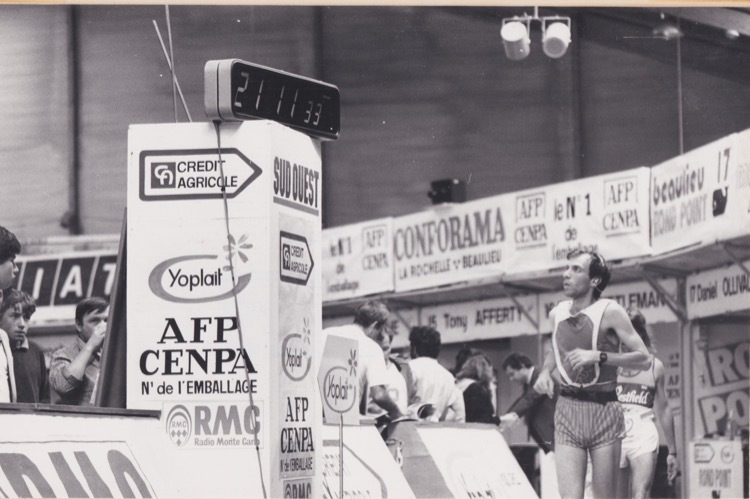 While at peak fitness in 1995, he went to Surgeres, France to run a competitive 48-hour outdoor track race that attracted the best ultra-distance runners in the world. The temperature was a scorching 100 degrees, but he was fit and went on to set a Canadian national record for the 48-hour with 221 miles, finishing 5th overall. It is one of his many Canadian records which still stand today. Yiannis Kouros and Trishul. Photo from the collection of Trishul Cherns. 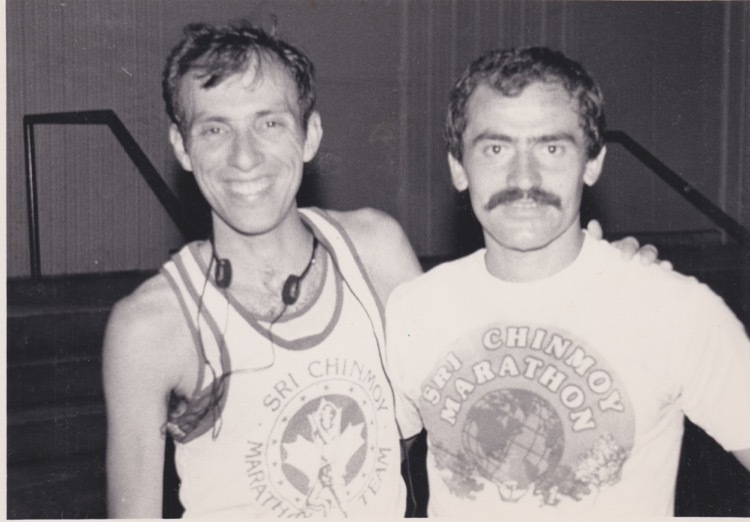 In 1996, Cherns continued to challenge himself, running the Sri Chinmoy 2,700 Mile Race in 45 days, 15 hours. 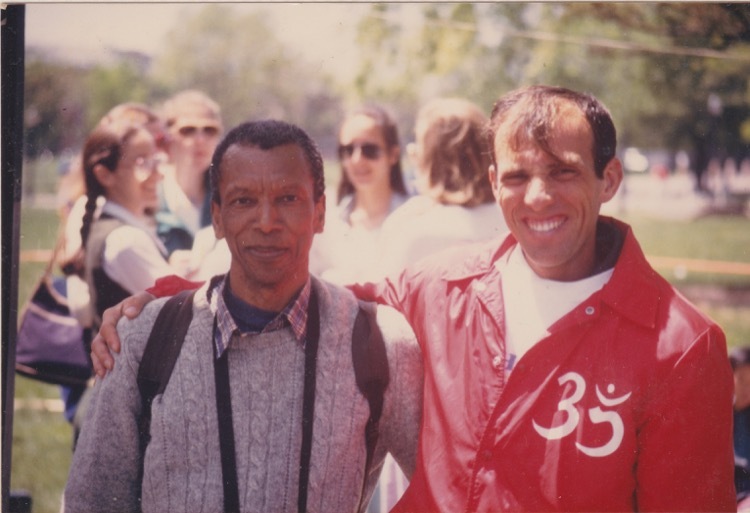 Then in 1999, he set out to run the world’s longest certified road race, the Sri Chinmoy Self-Transcendence 3,100 Mile Race, around a single city block in Queens. He gritted his way through consistently hot and humid temperatures to finish in 50 days, 3 hours. He would return to run the Self-Transcendence 3,100 two more times, completing it in 2003 in 55 days, 2 hours, and again in 2005 in 54 days, 16 hours. Phil McCarthy came up with the concept of a 100 mile course starting and finishing in Times Square, traversing the far reaching boroughs of the Bronx, Queens and Brooklyn to showcase New York City’s lesser known areas. 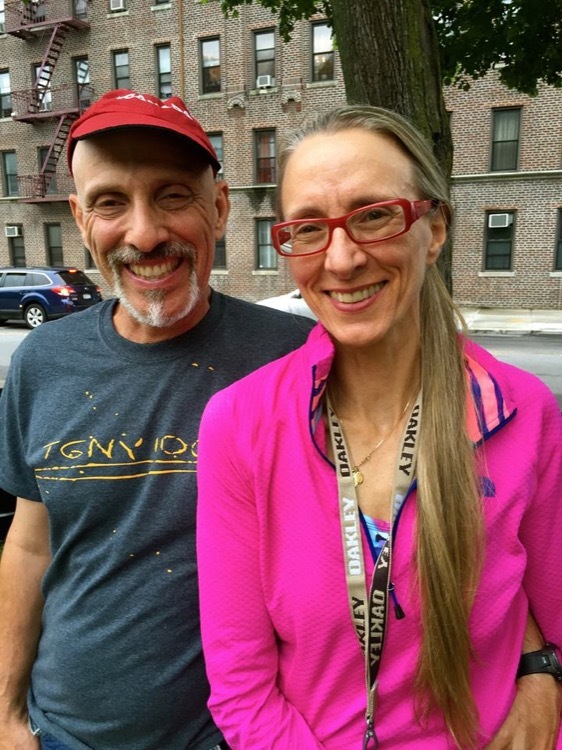 It would be called The Great New York 100 Mile Running Exposition (TGNY 100), and Cherns, having run virtually every other ultramarathon in the area, had to try it. So in the humid summer of 2012, he took off with 20 other brave runners for the inaugural running. The course lacked proper volunteer support which added another layer of difficulty. He approached McCarthy and the next year joined as assistant race director, in charge of coordinating volunteers and captaining the 100 km aid station, to which a 100 km finish option was added. His wife Käären and other top notch volunteers join him each year to make sure the runners are well taken care of and fed, with pizza and eggplant parmesan ready to serve. Cherns continues to live in Queens, five miles from the Sri Chinmoy ashram where he once resided. He works as a massage therapist, trekking his portable massage table into people’s homes throughout Manhattan and other sections of New York City. Although he has been in the United States for 40 years, he has retained his Canadian citizenship, thus keeping all of his Canadian national records. He maintains a thick timeworn binder with meticulous notes of each race he’s completed. When added up he has run 247 ultramarathons with over 42,000 racing miles… and counting. By his estimation, in May 2018 at Rock the Ridge 50 Mile, he will reach his 250th ultramarathon. He’s hoping for some friends to join and run it with him to celebrate. 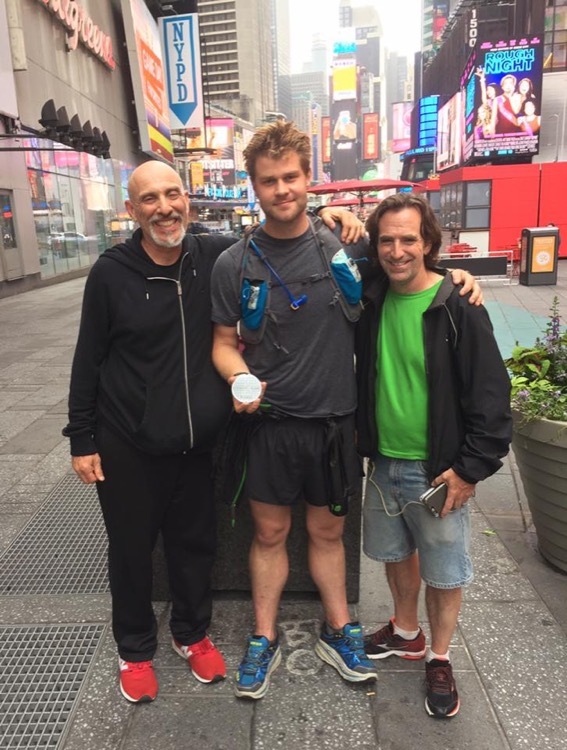 And so at the 2017 TGNY 100, after limping my way through the night, crossing over the Brooklyn Bridge and finishing in the heart of Times Square, Trishul Cherns was there with a smile to congratulate me for finishing 100 miles. His presence continues to enrich the New York running community. 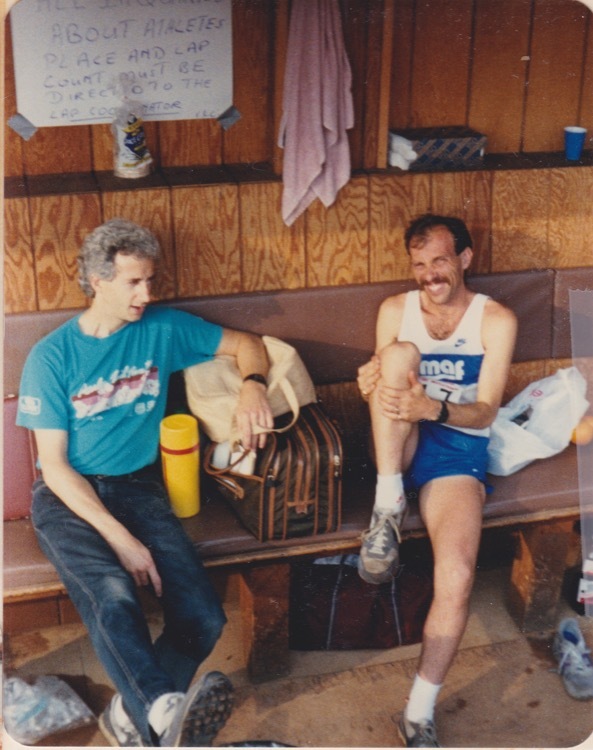 I’m a retired ultra runner now living in Florida, I remember Trishul from my days in NY and running some of Broadway Ultra Society’s wonderful races. These memories are golden to me know. Super story – thank you for profiling Trishul and Käären so beautifully. 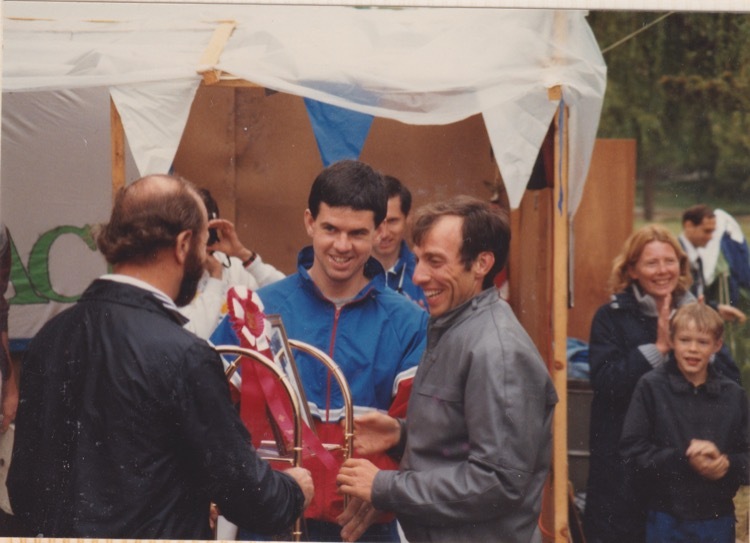 They organized the very first ultra I ran in July 1987 – the Vail Valley 50! Trishul was a mentor, then a training partner, then a good friend. It was a great job on his profile by Ulttarunning. There should be a Hall of Fame for ultrarunners and he’d surely deserve the honor. the pot of gold at the rainbow’s end. Congratulations.